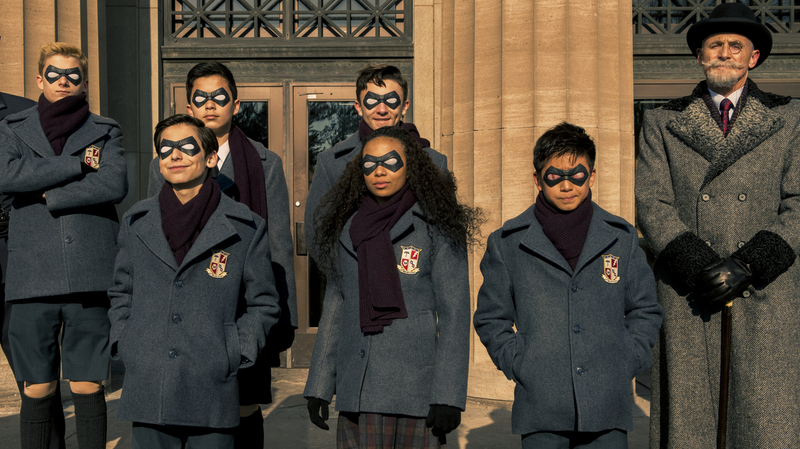 Review: 'The Umbrella Academy' Suffers From Overcrowding Everybody gets an arc in Netflix's adaptation of a beloved school-for-superheroes comic, which captures some of the madcap zest, but parcels out each character's revelations too slowly. Know that we still have each other: The members of The Umbrella Academy (l to r: Cameron Brodeur, Aidan Gallagher, Blake Talabis, Dante Albidone, Eden Cupid, Ethan Hwang, Colm Feore) say cheese. "We don't have time for this!" That sentiment gets expressed several times, always urgently, by different members of The Umbrella Academy's teeming cast, over the course of the 10 episodes that premiere on Netflix Friday, Feb. 15. You can understand why they'd keep saying something like that: After all, the Doomsday Clock is ticking away humanity's last moments. As the series opens, the Apocalypse is mere hours away, and the fractious superhero-team/dysfunctional family at the show's center spends that time bickering with, or sullenly resenting, or pointedly ignoring, or emotionally sandbagging each other. Look, all superhero teams quarrel; it's as much a part of the gig as the boots and the buffness. Add in the fact that this particular super-team is quite literally a family (its original seven members having been adopted as infants by stern taskmaster Sir Reginald Hargreaves (Colm Feore)) and the squabbling makes sense. But the thing is: They're wrong. They do have time. Lots of time. Or maybe, given the unhurried pace at which events unspool over the course of these 10 hours, and the series' eagerness to indulge in flashbacks and other digressions, it just feels like they do. The Umbrella Academy is an adaptation of the Eisner-award-winning comics series launched in 2007 by writer Gerard Way (yep, that one) and artist/colorist Gabriel Ba. Specifically, this season of the show conflates elements of the first two six-issue volumes, The Apocalypse Suite and Dallas. There's a lot about those comics that makes them prohibitively difficult to adapt to any screen. The size of the cast, for one thing (there are seven Hargreaves children ... to start with, anyway), the concurrent timelines (we follow the adventures of the group as both an eager team of super-powered celebrity kids in school uniforms, as well as as an embittered assortment of estranged adults), the sheer imagination crowded into every frame (tentacled monsters and space-apes and sentient landmarks and world-ending stringed instruments and torturous plotting, involving the knotty logistics of temporal displacement). Mostly, the comics are so densely constructed that you read them knowing you're only skimming the surface of the roiling, madcap universe Way and Ba constructed. There are allusions and cues and hints that only make sense on subsequent readings, and even then ... only juuuuust. That's simply not how TV shows work — at least, not yet — so the producers of the Netflix series have created something else: a loose adaptation that thins out the comics' hilariously condensed plotting to stretch it over 10 episodes, borrowing elements and characters from disparate storylines and retrofitting the show's six main characters with the usual TV-series accouterments: backstory, unspoken desire, emotional arc, resolution. Well. That's the real question. Because there's much about the series itself that works, and works well. The performances, in particular: young Aidan Gallagher, as the Academy member known only as Number 5, plays a 58-year-old man in a young boy's body (long story), bringing a world-weariness that supplies a regular dose of wry humor. Much is asked of Robert Sheehan, who plays Klaus, a queer, scheming addict who's turned to drugs to blunt his power to summon the dead; he supplies both the one-liners and, later on, a sense of tragic loss. Ellen Page, as long-ignored sibling Vanya, transforms from emotionally numb sad sack to ... something else, over the course of the series. The great Kate Walsh turns up, as a smirking, knows-more-than-she's saying presence who adds "morally gray" to the series' color story. And Mary J. Blige (!) in a blunt-cut bob makes her inimitable presence known as one of a pair of mysterious assassins, though most of the oxygen in their scenes together is taken up by her partner, played by Mindhunter's malevolent M.V.P., Cameron Britton. He's great, if a bit muted here, driven not by an opaque sense of mundane depravity as much as a tetchy, disgruntled snippiness. The show's design and special effects evince a distinct idiosyncratic flair that grows less distinct and idiosyncratic when stacked up against that of the show to which it will be inevitably compared — FX's Legion. Both series gleefully employ ironic things like music cues, creepy animation and elaborately incongruous dance numbers to establish a playful absurdism. But where Legion positively luxuriates in its high weirdness, Umbrella Academy holds it at arms' length; the story it wants to tell is more straightforward. Or rather, the stories it wants to tell. Because that turns out to be the pressing issue: Having six main characters (seven technically, but that's a spoiler) means trotting us dutifully through six sets of familiar story beats, while creating different pairings to give each manifold dysfunctional-family interpersonal dynamic a chance to register. The result is a season of television that seems at once overstuffed and thinned out — long on character and events, but short on any sense of mounting tension, urgency or consequences.